George Frantz, has a deformity of the hands and feet, which is known as lobster-claw or syndactylism. He was the second child in a fraternity of six. His older brother, who died at the age of two weeks, had the same deformity. His three sisters are normal; his younger brother has an extra little toe on one foot. 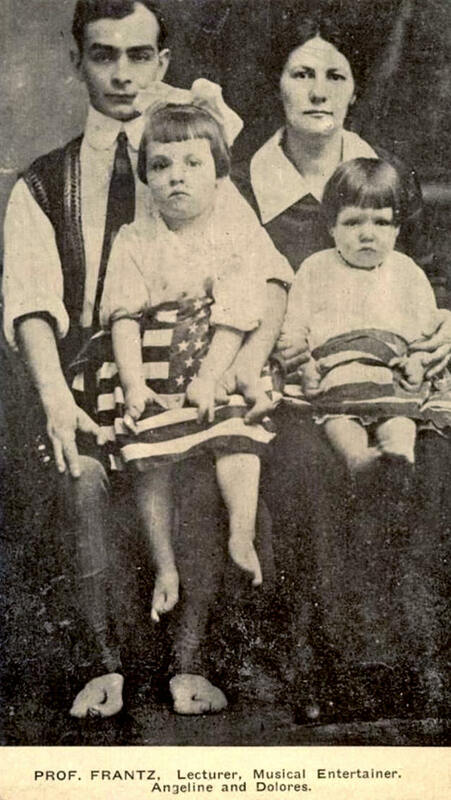 George married a normal woman and had two daughters, both of whom are syndactyls like himself. These are the only cases of syndactyly which have occurred in George's family as far as he knows, George's mother and some members of his father's fraternity are living; and all are normal and deny the existence of any syndactylism in past generations. However, the investigator (Dr. Elizabeth Muncey, formerly of the Eugenics Record Office) felt that George's mother knew in which branch of the family the defect originated. 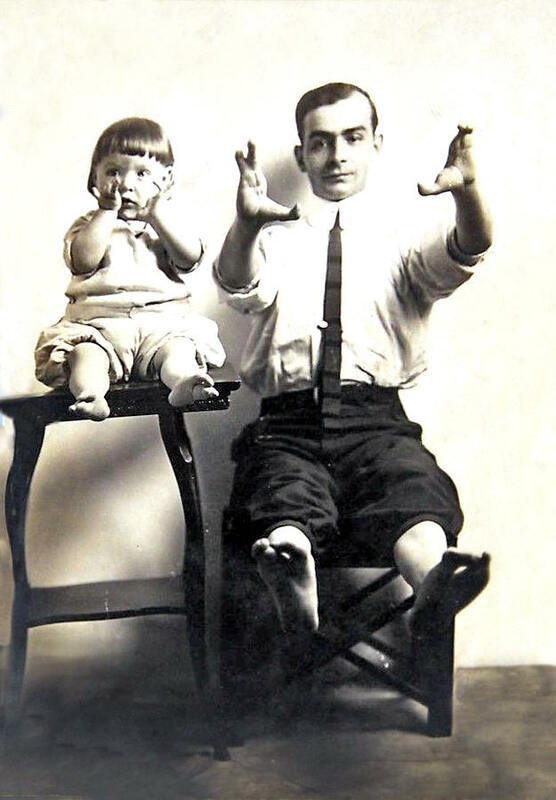 George was born in this country of Austrian parents, and for a time before the war was in the show business, exhibiting himself and his older daughter, Angeline. After the war he obtained a clerical position. 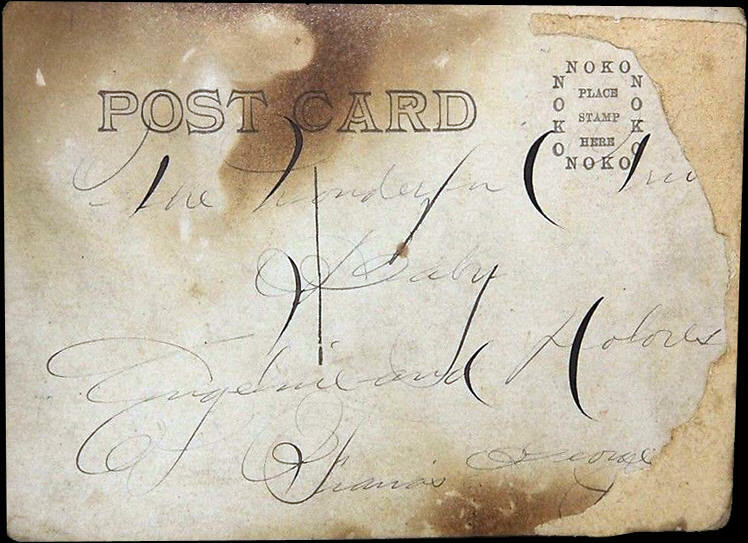 In spite of his deformity, he is an excellent penman, and it is interesting to note that Angeline also, who was seven years old at the time the family was studied, was doing excellent work in penmanship, and in drawing was one of the best in her class at school. Her hands and feet are like her father's. The younger daughter, Delores, has two fingers of her left hand joined as well as those of her right. "A careful examination of the hands and feet showed that there were five metacarpal bones, although the second and third seemed fused almost their entire length. There was a dimple in each terminal joint however (V). In the hands of Angeline and her father the little ring fingers seemed to be attached to their proper metacarpal joints, but in the hand (left) of Delores it seemed like two little fingers, both being attached to the fifth metacarpal joint. "There were only two meta-tarsal bones in each foot. I could not feel the slightest indentation between the bones except where the drawings show a V. The father said his feet were exactly like the others." In the outline drawings the dotted lines indicate the position of a sharp contracture of the fingers. Note the distinct difference between the left hand of Delores and both the right and left hands of Angeline. George would not allow his extremities to be drawn or X-rayed.